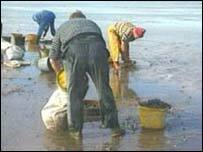 The death of 19 cockle pickers in Morecambe Bay has added to its reputation for being a deadly area for the unwary. The bay, which boasts the largest area of intertidal sand and mudflats in the UK, is well-known for its treacherous sands and fast-moving incoming tides. One coastguard told BBC News Online: "There have been these sorts of tragedies since time immemorial." A man and his son died just two years ago after being caught by the tide. The Cumbrian bay, Britain's second largest behind The Wash, can appear deceptively calm. Morecambe Bay is extraordinarily dangerous... you can't take it for granted." But its funnel-shape, broad and shallow formation and a 10 metre-high range in its tide mean it can change into a death trap in minutes. The flood tide rushes into the bay faster than a man can run and seawater that surges up gullies between sand ridges can easily cut people off. Royal guides have been appointed for hundreds of years to guide travellers safely across the deadly sands. Parish councillor Keith Budden told the BBC: "People should understand this is a dangerous place to be if you don't know it. "There are all sorts of gullies and rivers that run into the bay and they change on a daily basis. "Areas that can appear firm one day can be quicksand the next," he added. The combination of rising flood waters and ferocious incoming tide meant the trapped cockle-pickers "didn't stand a chance", a sands expert said. Alan Sledmore, who guides people across the bay, said "The area is very dangerous... the cocklers were caught between two channels." Mr Sledmore, who can spot quicksand areas and gauge how fast the incoming tide is approaching added: "At the moment we have got high tides and we have got all the flood waters with their problems. "When people try to cross, they meet these incoming tides. "With the flood waters coming one way and the tide coming another, the cocklers really didn't stand a chance. "It was tragedy waiting to happen." 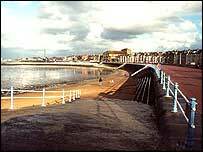 Lancashire police chief constable Paul Stephenson said: "Morecambe Bay is extraordinarily dangerous. "The locals and experts all know you cannot take it for granted." Two weeks ago, 30 people were rescued in the bay in a similar operation as that involving the cocklers. Stewart Rushton, 51, and his son Adam, nine, died two years ago in January when they became disorientated in fog and the sea suddenly closed in on them in the bay. The father-of-four had hoisted his son onto his shoulders as the sea swirled around them and called the emergency services from his mobile phone, but rescuers were unable to reach them in time. "The rescue operation will continue"